Sometimes, you can have the deck stacked against you, and with a little prayer, things just work out better than you could ever hope for. This family decided they wanted portraits several months back, but the timing of other events pushed out their session date to the middle of September. No worries, it was still technically Summer at least temperature wise. But then the location that we selected scheduled an event and they put up banners and every other tacky thing you would not want in the background. So, we scrambled and came up with Plan B. Fortunately, Glastonbury has a wonderful walking trail over by the Connecticut River with beautiful woods right next to it. Perfect! Then I got sick. Like, I thought I wasn’t going to make it, sick. But with a ton of medicine, cough drops and a huge infusion of sweet tea (it truly works miracles, which is one of the reasons we Southerners drink it), I worked through the whole session and it turned out beautiful! 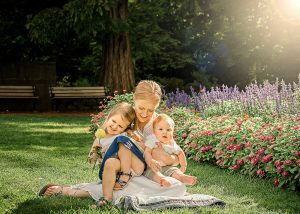 Momma’s biggest desire was to capture her 4-year-old little boy in photographs in all of his glory at this stage. He was a total doll to play with too. So curious and full of adventure. He was getting a little antsy at this point, so I gave him permission to do something that would otherwise not be allowed. Throw rocks in the air! He could have done this all day. We must have sat on every log (and even near a patch of poison ivy) during our session. But putting kids up on something is sometimes the only way to get them to stay put. I think Dad’s lap was a favorite, though, as there were only smiles. This fun moment happened during a spontaneous tickle session. They were all having fun at this point and not thinking about the camera at all. And that’s what you want. To give their little boy a break, we took a few pictures of the happy parents together as well. They’ve been together over 10 years now, and they look as happy as they probably did on their wedding day. Such a sweet moment. Her sweet son was telling his Mommy that she was the prettiest lady in the whole world. I have to agree with him, and I know he’ll always feel that way. We ended our time together with a simple walk back. I’m sure they’ve done walks like this many times and will many more as their little boy grows up. But something about seeing it in a photograph makes it special and not ordinary. It’s little moments like these that we’ll all cherish once our children grow up. And having this visual reminder will help them relive those special moments for a lifetime. So even though we kept getting curve balls thrown our way, this family showed up with the idea that if they just enjoyed the afternoon and had fun it would all work out. That easy-going spirit came shining through in all of their images. And now all anyone who sees these images will notice is the tender love that they have for each other. Like I said, it turned out better than I could have ever hoped for!